The 2018 Toyota RAV4 Hybrid packs powerful efficiency, eye-catching style, along with an interior that’s both comfortable and versatile. RAV4 Hybrid is powered by a 2.5L 4-Cylinder engine with legendary Toyota Hybrid Synergy Driver producing 194 net horsepower. When Mother Nature rains on your parade, RAV4 Hybrid comes equipped with Electronic On-Demand All-Wheel Drive with intelligence (AWD-i) which ensures you’ll always have ideal traction in any situation. Enjoy outstanding efficiency driving the RAV4 Hybrid, which achieves an impressive EPA-estimated 34 MPG city fuel economy rating**. With the available Entune™ Premium Audio and App Suite, RAV4 Hybrid drivers can enjoy access to their favorite multimedia while on the go. 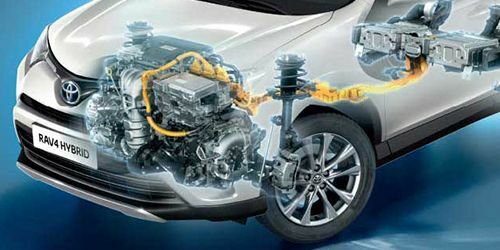 With 194 net horsepower, the 2.5L 4-Cylinder engine using Toyota Hybrid Synergy Drive offers responsive acceleration in addition to remarkable fuel efficiency. No matter where you’re headed, you can count on the RAV4 Hybrid to get you there. Using standard Electronic On-Demand All-Wheel Drive with intelligence (AWD-i), the RAV4 Hybrid provides ideal amounts of traction when things start to get slippery. 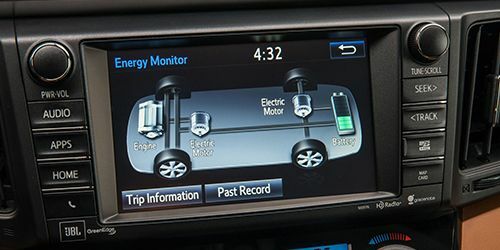 Monitor the Hybrid Synergy Drive system with just a glance at the unique gauge cluster found on RAV4 Hybrid. 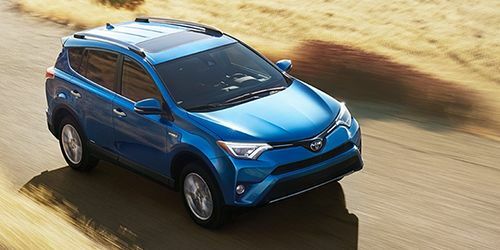 With an EPA-estimated 34 MPG city rating**, the Toyota RAV4 Hybrid will make your wallet happy as you drive past gas stations. Tame those chilly mornings with available heated SofTex®-trimmed 8-way power-adjustable front seats. RAV4 Hybrid offers a standard power tilt/slide moonroof with sunshade which allows you to fill the interior with natural lighting and fresh air. Standard dual-zone automatic climate control ensures that drivers and passengers can each fine-tune their ideal temperature setting. 60/40 split folding rear seats allow for a maximum cargo capacity of 70.6 cubic feet, meaning that you’ll always be able to bring that extra suitcase along for the journey. 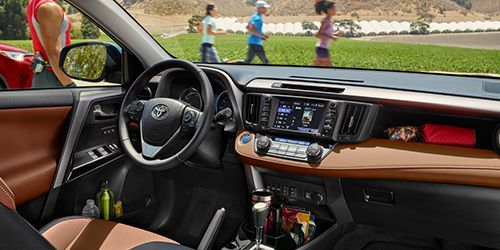 The Toyota RAV4 Hybrid offers a smart drive with connected technology. A comprehensive energy monitor provides real-time information showing how power is being used via the operation of the gas engine, electric motor, and hybrid battery. With only the swipe of your foot underneath the rear bumper of the RAV4 Hybrid you can open the hands-free power activated liftgate, even when your hands are full. Use the available Bird’s Eye View Camera with Perimeter Scan to see an overhead view of the vehicle, helping you maneuver into tight spaces. The Toyota RAV4 Hybrid delivers outstanding value. In fact, U.S. News & World Report named the Toyota RAV4 Hybrid the 2017 Best Hybrid SUV for the Money. **2018 EPA-estimated mileage. Actual mileage will vary.